Cost effective and easy to install, pre-assembled units are ready for plumbers to connect (support brackets are included). Dirt traps have been minimised though innovative design, allowing for easier, efficient and cost effective cleaning. Pre-finished Compact laminate vanity top, up-stand and skirt. Maica range of colours and decors. Other colour options available on request. 1800 mm long x 500 mm deep benchtop with Single lever basin mixer(s). Under bench mounted 300 mm diameter x 120 mm deep Stainless steel Mercer G-9 sinks. Suitable for high and low pressure water supply systems in high use and wet areas. 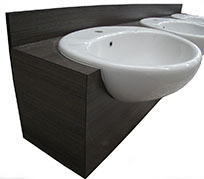 Under bench mounted sink provides a smooth and unobstructed bench surface for hygienic and easy cleaning. The 250 mm skirt below the benchtops is designed to hide the S-bend, pipes and brackets. The vanity benchtops are CNC machined to provide half-rounded edging. Cost-effective, easy to install, pre-assembled units are ready for plumber to connect (support brackets are included). 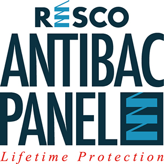 Compact laminate benchtop technology provides an extended product life – 10 year Guarantee on panel integrity. Dirt traps have been minimised through design, allowing for easier, efficient and cost-effective cleaning. Different configurations available, including, corner, single, double, or triple sinks.